The London Beer Writers – MostlyAboutBeer……..
On Wednesday evening, the London Beer Writers Meetup took place at the Craft Beer Company, St Mary Axe in London’s financial district. The Meetup consisted of a certified beer Sommelier who works for Fullers Brewery (Ben), the published author of Beer Means Business (Csaba) and a blogger and sometimes magazine contributor (me). As texts to offer feedback on, Ben’s work was about the growing beer scene in northern Spain. Csaba presented part of a project he’s working on about the factors influencing consumer choice in the marketplace. I offered my piece about the debt the public owes to the nation’s bar staff and publicans. These three topics were as varied as the beers showcased along the bar a few feet away from where we sat. It’s enlightening meeting up with other writers whether they be a simple enthusiasts, bloggers, vloggers or someone who works in brewing, marketing, development or in any other ale-related capacity. The beer and brewing culture has become such a wide magisterium – the insights come from backgrounds that are multiplying. Though all three of us write about beer, our own backgrounds are diverse: civil engineering, EU policy and regulation management and front line emergency services. 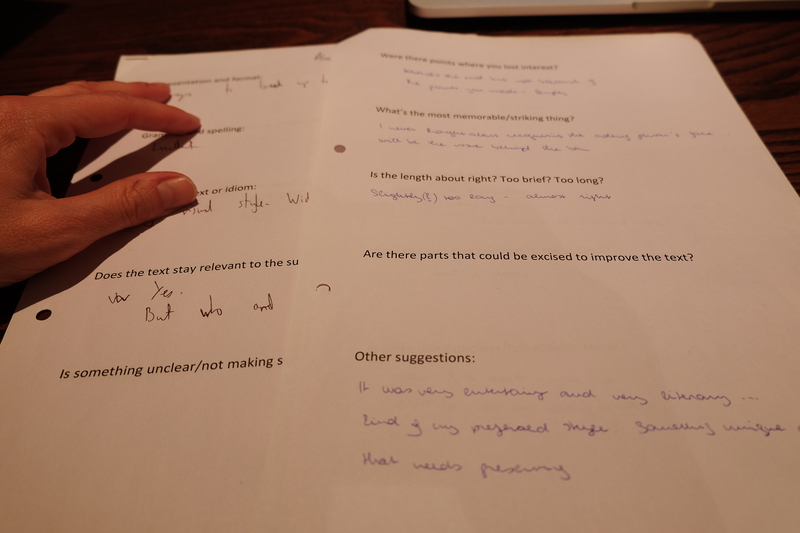 The way this Meetup works is we read each others’ work and then write down our thoughts. There are some useful little questions on pages I supply to function as whetters if you’re a little dry. It’s structured but far some scientific and it’s definitely a work in progress. When you read a text, there is no such thing as a right or wrong reaction to it. What kindles the flames for one reader might just snuff them out for another. All viewpoints are equally valid. At the London Beer Writers Meetup, you’ll hear praise and the criticism is constructive and friendly. It could be conflicting or you might see patterns emerging in the feedback. You simply mull it over and next time you sit down to write, it might well influence it. The point of this Meetup is to grow as a writer and help others to do so. What’s impossible to do as an author is become another person reading your own work because as its creator, you can’t shed your own bias. Sometimes only getting someone else’s opinion will do. And it’s as simple as that. It makes you think about what you write about and how you write it. Apart from the three official topics, we also found time to discuss CAMRA’s softening stance on key kegs, the Pig’s Ear Festival, red kites, Sierra Nevada, Belgium, Zurich, Watlington and the Vicar of Dibley. Not only that but we honed our magical skills – namely by making pints of Dark Star, Beavertown, Kernel, Orbit, Weird Beard & Tiny Rebel disappear. Your work comes across as well-researched and succinct. You also have a knack for finding amazing old photographs. Keep it up.